WoT fans, it's time to toss the dice! 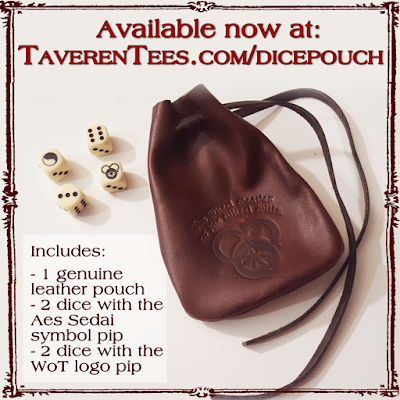 The Wheel of Time Leather Dice Pouches are now available for sale. Pouches are embossed with "The Wheel weaves as the Wheel wills" on genuine leather and can be purchased with four dice at TaverenTees.com/dicepouch. You can also pick up extra sets of dice only (limited stock) at TaverenTees.com/fourdice.